No matter what your age is today, at some point you’re going to want to stop working. And when you do that you will rely on passive retirement income to support yourself for the rest of your life. That being the case, the question is, how safe is that income? Even if you are already retired, you still have to be concerned about the safety of your retirement income. That’s because once you start making withdrawals, the money has to last for decades and decades (hopefully). If things don’t work out, who wants to go out and find a job after you retire? My guess is, not you. No doubt about it; retirement income safety is what it’s all about. What Are The Threats To Your Income? There are two main issues to consider. First, of course, you need to make sure the sources of your future income are solid. For example, if you make personal loans to your children or others, don’t build your financial future based on actually receiving those repayments. You might get the money back but it’s probably safer to assume you won’t. And if you own rental real estate, remember that your property may be vacant in the future – at least for awhile. Other times, you’ll have to pour money back into the property for renovation. Please take that into account and don’t count your chickens before they hatch. When we talk about retirement income sources, of course the topics of Social Security and pensions come up. Not long ago everyone I spoke with was really worried about Social Security running out of money. The way things are going in Washington, I can see how people are concerned. But chances are good that Social Security will be there when you need it – albeit the government will probably increase retirement age in the future so may have to wait a few years longer than you expect to receive those checks. With regards to pensions, I wish I could be so optimistic but I can’t. Many pension plans are underfunded these days and it’s a big concern. Besides making sure that retirement income is going to be there when you call it a day at work, the next question is, how long will your income last? This is especially important when you think about investment income. 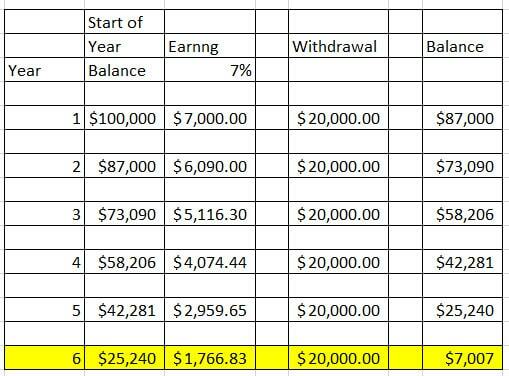 You can see that even if you do earn 7% on your investments, the truth is by year 6 you’ll be just about broke if you withdraw that much. This means if you retired at 65, you’ll have to go back to work at 71 or 72 in order to survive. Not acceptable. You can see from the example above, the big problem this person faces is spending – not investing. They are earning a hypothetical 7% and that is great. It would be hard to earn much more than that without getting super speculative. In this case, the problem is that they are spending much more than they can afford. Make sure you track your spending starting now. That helps you determine what you’ll be spending once you retire. And once you know that, you can fine-tune your plan. When you consider how to invest your retirement money, think about the big picture Pilgrim. Your money has to last another 20 or 30 years after you retire. If you get too conservative too soon, you will find it difficult to grow your money to combat the rising cost of living and thereby create sufficient income. Successful retirement rests on a three-legged stool; how much you spend, your wages, and how much your investments earn. That’s why everyone has their own unique financial plan – everyone’s balance and needs are different. You may need to work a little longer. You may need to cut back on spending and invest differently starting now. You may need to do a little bit of each. The only way to know if your retirement income is safe is to run some projections and see if your plan works. If it does, fantastic. But if it doesn’t it’s not the end of the world. You can always adjust your spending, income and investing. And if you have to do that, the sooner you know about it, the better and easier it is. Is your retirement income safe? How do you know?